Our core competency is the patented triple.s point heating system for railways and other fixed guideway transport systems The system uses geothermal energy as an energy source, which is available free day and night, 365 days a year. This energy can be recovered from the ground earth and the ground water as well as from waste water and industrial residual heat in inner city and industrial areas. The triple.s point heating system has unrestricted DB approval, it is compatible with „all“ common rail profiles and radii, and it can always be perfectly optimised energetically using the finite element method. Near-surface geothermal energy is used as the heat or energy source. It is tapped by the triple.s system by means of depth probes and surface collectors or through the extraction of heat from the ground water, the air, or waste water. The system unit with heat pump technology is equipped with our highly efficient and specially designed regulation technology. The heat exchanger transports the heat to the rails. It was optimised energetically in such a way that unwanted heat losses are reduced to a minimum. Installation or de-installation for servicing purposes requires only a small amount of time and therefore is perfectly in keeping with the technical specifications and regulations of the railway industry. Our heat exchanger is prepared for the different rail shapes and dimensions. For the three main rail shapes we have developed a suitable heat exchanger profile in each case. These profiles allow precise machining and ensure consistently high manufacturing quality. Unlike traditional railway point heating with heat distribution only at certain points of the rail, the design of the triple.s heat exchanger profile allows wide-area and therefore even distribution. A further triple.s innovation is a special heat exchanger for grooved rails. 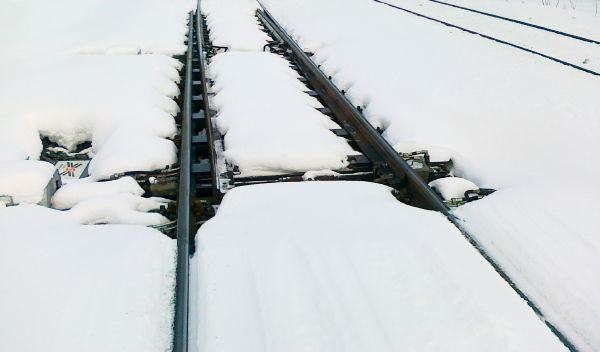 With this new design, tramway points and rails can also be heated. All common rail profiles, such as S49, S54 and UIC60, and also their special designs, are covered. Using the finite element method (FEM) we determine the exact heat requirement for each of our construction types and applications. The perfectly demand-oriented design saves costs and it also consistently improves the sustainability aspect in triple-s point heating. triple.s is the „only“ geothermal system that is operated as part of normal operations by fixed-guideway transport systems. The triple.s technology is protected in various countries by patents and utility models.